Scores of Thames Water Utilities-owned under rail culverts are benefitting from an innovative German solution for host pipe rehabilitation. VEDA is undertaking the analysis and design for around 150 culvert rehabilitation assignments with the solutions delivered in partnership with the rail team at water and waste specialist OnSite Ltd. The contract involves the rehabilitation of culverts identified as at risk of collapse or in a poor condition following CCTV surveys by Onsite. VEDA is in the process of assessing the lowest ranking culverts to pinpoint changes to culvert shapes and structural defects such as longitudinal and transverse fractures, and squatting. At an average rate of eight liner designs per month, VEDA is applying nonlinear analysis principles to calculate the liner thickness for the glass reinforced plastic (GRP) that form the structural liner inside the sewer host pipe. Challenges have arisen due to the oft-remote location of the defective culverts, such as within forestry or on the edge of water courses, the latter of which require the use of barges to provide a platform for the OnSite installation team. Further complications arise from the fact that single culvert host pipes have been constructed using an array of materials from concrete and cast iron to clay-based composites. This has been due to rail track extensions carried out over the years since the culverts were first built. VEDA also found variations in culvert shapes, from horseshoe and circular to egg-shaped. GRP pipe liners, also known as Cured in Place Pipe (CIPP) liners, are placed within the host pipe and inflated with air. A UV light train is passed though the liner and host pipe to cure the GRP’s resin in situ. This method allows the liner to take the shape of the host pipe. 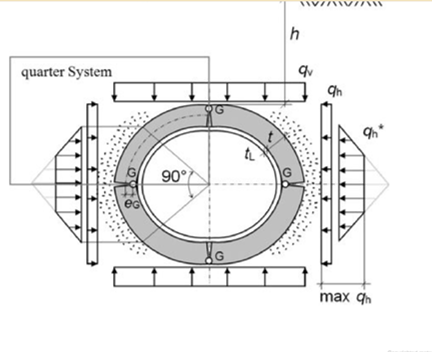 In cases were CCTV and nonlinear analysis uncovers a deformation ratio of more than 10%, the liners are inflated to a smaller diameter and the annulus between the liner and host pipe is then grouted. Depending on each culvert’s load requirement, VEDA specifies the liner’s thickness at between 4mm and 20mm. GRPs provide near steel strength structural support, giving the sewer an extended life cycle of 120 years. GRP liners are a popular technique for culvert rehabilitation in Germany – where most of the materials are produced. Because the solution is relatively new to the UK, VEDA is following German design code DW AA143 Part II to ensure the load capacity provided is sufficient in each instance.